Boulder City Councilman Macon Cowles’ father will be honored by Littleton’s mayor at a ceremony on Monday marking Martin Luther King, Jr. Day. The Reverend S. Macon Cowles, Jr., who passed away in 2002, marched with Martin Luther King, Jr. in the dangerous Selma to Montgomery marches of 1965. 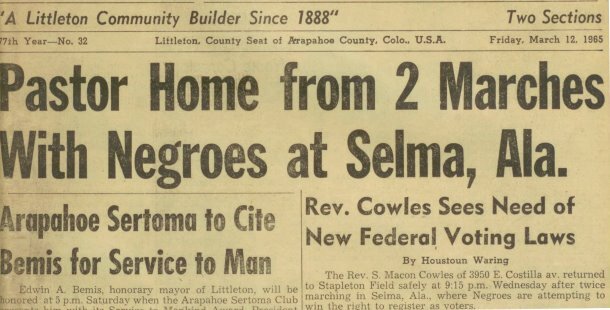 Councilman Cowles provided the Blue Line a copy of the Littleton Independent’s account of his father’s participation in the march to gain voting rights for African Americans. Rev. Cowles marched in the second of three marches, along with many who responded to King’s call for “clergy and citizens from across the country to join him” after the first march ended in violence (and is now remembered as “Bloody Sunday”). As reported by the newspaper, Rev. 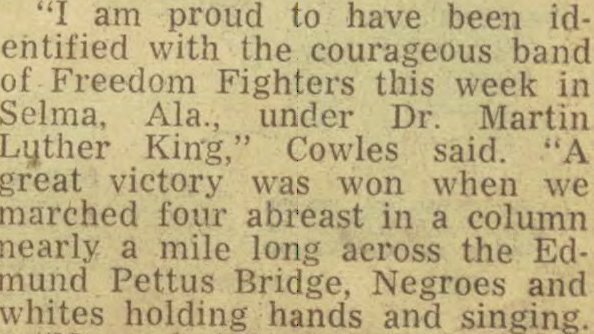 Cowles spoke with a Unitarian minister from Boston shortly before that minister was beaten by “five Selma Whites.” According to Wikipedia, a Unitarian minister from Boston who was beaten at the march later died of his injuries, after being turned away by the Selma public hospital. Also this morning, we are here to recognize the contributions of a very special individual. Although he passed away in 2002, the legacy of the Rev. S. Macon Cowles Jr. will never be forgotten. When Rev. Cowles and his family moved to Littleton in August 1962 to start a new Congregational Church, fair housing had become an issue demanding attention. When a Martin Marietta engineer moved to town to close on the home he had recently purchased, he found that the doors of his new house had been locked–locked by the real estate company that discovered something to their dislike. The engineer happened to be black. This caused shock, embarrassment and much soul-searching. Ultimately some good evolved from this event–the Littleton Council on Human Relations was founded. The Rev. Cowles was an enthusiastic member and became the eventual chair of the council. The Reverend’s tireless work for human rights, eventually led him to Selma, Alabama in 1965. Where, despite terrifying death threats, he bravely marched in solidarity with African-Americans at the peak of the civil rights movement. The March’s route has been memorialized as the “Selma to Montgomery Voting Rights Trail.” It is now a U.S. National Historic Trail. Accepting the 2011 Dr. Martin Luther King Distinguished Service Award on behalf of his father, I am pleased to welcome his son, Boulder City Council Member Macon Cowles.